Do you know how effective your business operations are? Can you predict where they need to be? Sure, you might have a broad idea of the organization’s current challenges and successes, but if you want to improve, you have to pinpoint exactly what you’re doing and how well you’re doing it. That’s where business process modeling comes in. Business process modeling helps companies document and assess their business processes and workflows so they can adapt and improve with precision and effectiveness. Here we’ll discuss exactly what business process modeling is and how it can support your company’s initiatives for long-term growth and success. Want to model your business processes? Organizations and companies use business process modeling (BPM) to visually document and understand their current (as-is) processes and identify opportunities to improve them. BPM is part of the Business Process Management discipline, which focuses on improving performance by managing processes. Among other tasks, Business Process Management uses BPM to discover, model, analyze, optimize, and automate business processes for greater corporate success. When you know your current processes, you can make sure they are aligned with your greater organizational strategies and initiatives. BPM helps leaders maintain consistent processes and adapt to and evolve with changes effectively. Successful organizations rely on streamlined processes that operate consistently and as expected. 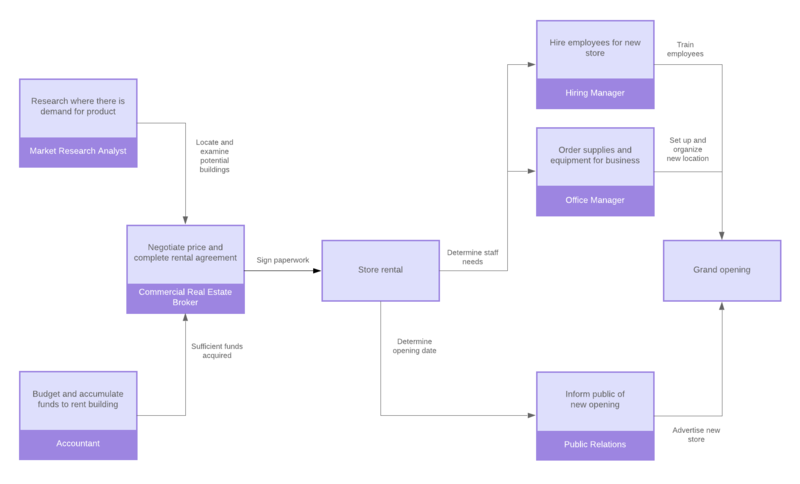 By mapping out your business processes, you can see each step in your operations and keep everyone on the same page. With one operational source of truth, you can rest assured that everyone is working from the same playbook. Business process modeling helps leaders and employees understand each level of operations and their roles within them. Consistent, standard processes improve efficiency across the board. When stakeholders know their roles and leaders are able to identify opportunities for improvement, operations run more smoothly. Clear communication is essential for a well-run operation. Process modeling is an effective way to communicate people’s roles and show how their work relates to the rest of the process. This understanding helps prevent bottlenecks and miscommunications. Additionally, documenting your processes mitigates the risks of knowledge loss in the event of turnover and team changes. With everything clearly recorded in your process model, new team members can quickly get up to speed. There are numerous ways to approach business process modeling. Three of the most common modeling methodologies are Business Process Modeling Notation, Universal Process Notation, and original process flowcharts. BPMN is the gold standard for process modeling. It is a standardized graphical notation that depicts the steps in a business process. BPMN was designed to be easily understood by high-level stakeholders while remaining technical and specific enough for operations managers to implement the processes effectively. Rather than modeling processes through a textual narrative or creating process notation from scratch, BPMN follows a standard, common diagram language with a library of elements and shapes such as swimlanes, artifacts, connecting objects, and flow objects. Using this notation keeps everyone on the same page and ensures changes in personnel don’t affect process documentation in the future. Powerful diagramming solutions like Lucidchart make it even easier to apply these notation standards with a dedicated BPMN shape library and quick-start process templates. While there are advantages to a robust and detailed notation language like BPMN, its complexity can be a sticking point for many organizations. Both creators and consumers have to be trained and educated on the numerous symbols and notation standards before they can understand the process models. This can cost the organization time and training resources and create a barrier to adoption. UPN focuses on the building blocks of processes: the who, what, when, why, and how. Using basic text blocks and flow lines, UPN models what happens, when it happens, why it happens, who is involved, and how it works. This solution creates a more accessible notation for business processes that stakeholders at all levels can understand. 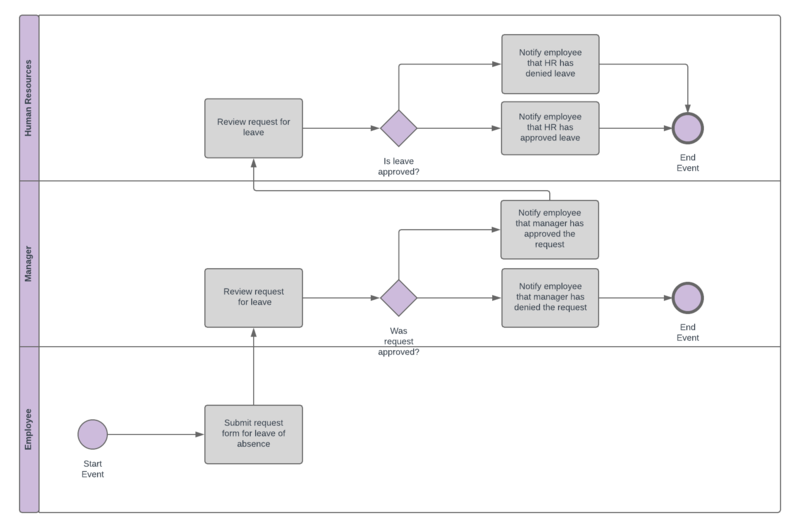 Of course, for those who want a more flexible process modeling approach, flowcharts are a popular choice. 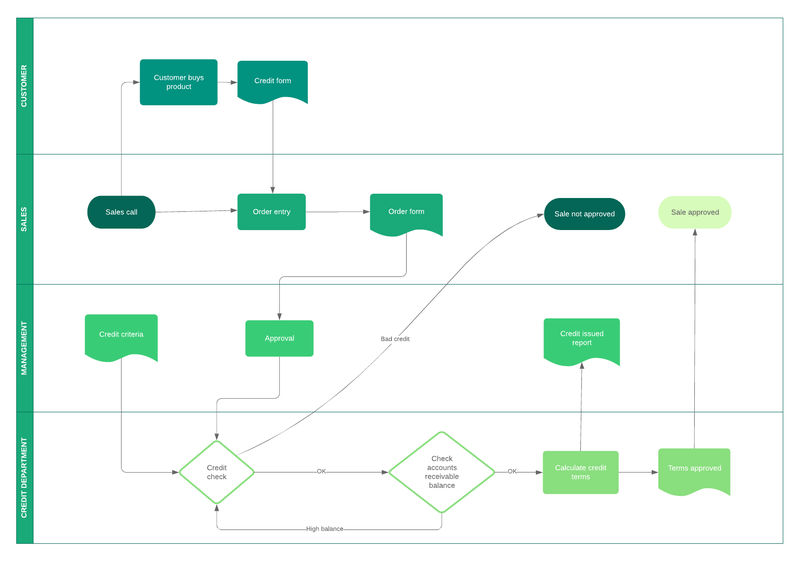 Process flowcharts lack the standard language of notations like BPMN or UPN, but they give the modeler greater freedom and creativity to visualize their processes how they want. You can draft a flowchart on a whiteboard or use a diagramming solution like Lucidchart to create an original process flowchart from scratch. Extensive shape libraries and intuitive drag-and-drop functionality make it easy to get started. The method you choose depends on your team’s needs and priorities. Some methods are more flexible or simple, which can be an advantage for teams or organizations that don’t want to deal with complicated notations to understand their processes. Greater flexibility can also give process managers and analysts the freedom and creativity they need to make process models that work best for their organization. On the other hand, opting for standardized language and structure like BPMN can ensure clarity and understanding across teams and departments. What are your reasons for modeling your processes? Your goals will help you define how much detail you will need in your model, which can also guide your notation choices. Business process models can get complicated quickly. Even if you need to go into greater detail in your model, keep it as simple as possible. Unnecessary complexity will just muddle the information and insights contained in your model. It may seem obvious, but too often, process modelers mix and match notation standards. Even if you create your own flowchart with original notation, make sure each element is consistently applied throughout the model to improve clarity and communication. Yes, you can map out your business processes with pen and paper or on generic diagramming software. But it will be much easier to create a clear and consistent process model if you use software designed for BPM. Lucidchart is a cloud-based diagramming solution designed to help business process managers create compelling process visualizations with ease. Its BPMN shape library gives you quick access to all the standard notations you need to map out your processes. When you’re ready, the collaborative platform allows you to share your process diagrams across the organization, so everyone has the most up-to-date information. When plans change, you can log in from anywhere to update the model, so nothing falls through the cracks.